MIAMI, Fl. -- A 99-year-old Florida woman got quite the surprise in the middle of the night when she awoke to find an exotic animal on her chest. The woman said she opened her eyes and saw the animal on her. At first, she thought it may be a cat, but when she realized what it was she screamed and ran. The animal ran up to the attic and was later captured by one of the woman's friends. Later, her family took the animal to the South Dade Animal Hospital where they learned it was a kinkajou. The species is a rainforest mammal native to Central and South America that is a distant cousin to raccoons. 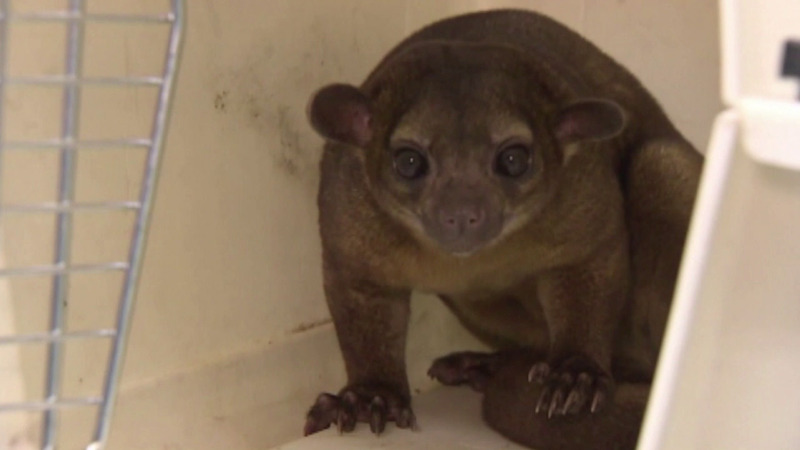 Officials said the kinkajou was being kept as a pet and that it must have somehow escaped. The owner eventually went to the animal hospital to pick it up.